UPDATE: The Favor Tokens are due to the special ability of the Japan Urban Assault mastery item and will last for 10 days if and when you finish it. Favor Tokens which are required for Japan Syndicate Jobs were added to the Daily Fix. They haven't been added to the list of items you get from this feature but I'm sure it is on the Zynga to do list! Anyone else notice that Jen hasn't posted a message for nine days now...she might be gone for good. If so, good for her. Oh, I doubt she's out yet. Seems that LL is gone for good and now, as I am about to delete the shortcut to her blog, seems like a good time to express my appreciation and gratitude for all her hard work and dedication. For the past 5 years, this blog was the first thing I checked when I woke up and the last thing I checked before I went to bed. The technical information provided was eminently helpful and I was always impressed by the elegant writing style and the way in which she handled detractors. Above all, I always felt that LL was one of us: a true addict. MW is a much smaller place without her. Best wishes and regards LL. Since this will be the last time I visit the blog I wanted to extend my gratitude to the Loot Lady for all her years of hard work on this site. 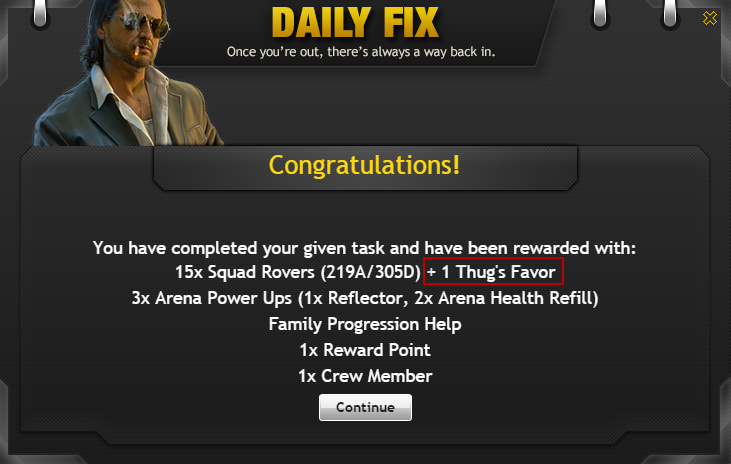 I retired from the game a few years back but always checked in to see the latest news on Mafia Wars. The Loot Lady has helped so many of us through the years with our gameplay. I know it was a labor of love and all of the critics had to be tiresome to deal with on a daily basis. I'm glad the Loot Lady has moved on to bigger and better things and I wish her only the very best. So if LL is gone who is reviewing the comments? Is she really gone or just taking a break? Is someone connected to her going to respond? Jen, Thank you for the time you've put into this blog. I miss your commentary. I hope you are doing well. Thanks to Edward Larson who has a peanuts cartoon about mwll. Link does not work... "502 Bad Gateway"
I appreciate everything Jen did. I hope she is ok. I'm sad that she didn't even say good bye.